GU is a friendly forum. Treat other members with respect. This is a place for us to make you aware of changes on the forums, updates, and any issues pertaining to the rules of the site. Having problems with any features on the forums? Please post them here. Other members may be having the same issues. 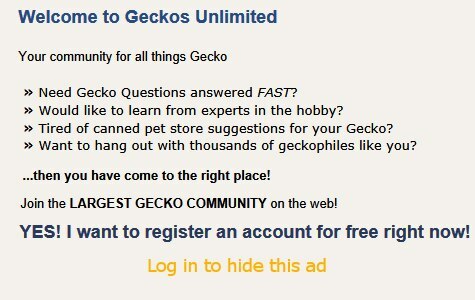 Keep an eye out here for Geckos Unlimited contests!!! Post pics and info about yourself, your reptiles, your pets, and other fun stuff. This forum is for getting to know each other on a social level. If you are new to the forums and have some questions, please post them here. (NOT for leopard gecko or crested gecko morph ID) This is for people who need help in getting an ID on what species a specific gecko is. Share care and information about this popular species with other gecko enthusiasts. Can you have double hets? There are 89 species in 15 genera occuring in this subregion, including Afroedura, Chondrodactylus, Pachydactylus, Palmatogecko, and many more. All Eublepharis EXCEPT the common leopard gecko should be discussed here. For Leopard Gecko info scroll to the top of the forum and click "Leopard Gecko Forums" Tab. This forum is for all of you Aussie gecko fans out there. I just had to give these geckos their own forum. They deserve it! Discuss other Rhacodactylus species, Bavayia, and Eurydactylodes. Crested geckos are hardy and attractive and have become one of the most widely kept gecko species in captivity. Utilize this forum to share crested gecko information. Utilize this forum to share care and information about banded geckos. Share husbandry information and photos about these unique geckos here. Finally, a forum for day gecko lovers! Discuss the geckos of this genus in this forum. Frog eye gecko licking sand? Here is your new forum, guys! I have a feeling this is going to get a lot of attention. I know that there are some leaf-tailed keepers out there. Don't be shy. Share care and information about this species here. Just as popular today as it was over 30 years ago, the tokay gecko continues to fascinate keepers at all experience levels. There are entirely too many amazing species to spotlight all of them, so I created this forum. Share info about yourself, introduce your leos, and post general pics of them. This is meant for more "social" type leo posts. NOT for health problems. General care questions and guidance. Setting up your leopard geckos enclosure, heating, and stuff not covered in the other leo forums. There are a million different opinions on what makes the best substrate for your leo's enclosure. This is the place for discussion. KEEP IT FRIENDLY AND CONSTRUCTIVE! Not sure what morph your leo is? Want to know what happens if you cross one morph with another? Here's the place for that info. What should you feed your leo? How much should you feed it? How often? Find out here. Any questions about how to breed your leos or how to incubate and hatch their eggs go here. If you think that your leopard gecko is sick or have specific questions about leopard gecko health, disease, or parasites, this is the place to start. Making your vivariums and enclosures natural and realistic. For instructions and questions about building and designing gecko related stuff yourself. Have any breeding or incubation questions? This forum allows gecko breeders to share information about gecko reproduction and incubation. Discussion of any health related topics, including prevention, diagnosis, treatments, medications, dosages, etc. For those of you who cool your collection, share some tips with other geckophiles. Any taxonomy related issues should be addressed in this forum. If you are sponsoring GU privately or if you are running banners, feel free to update us on shows/sales/promotions. All others will be deleted. This is for sponsors only. All classified threads are listed here. Use this forum to share your photos and experiences from the field or other herp travel. Discuss ethical & political issues concerning our hobby. Discuss herp photography techniques, equipment, lighting, etc. Do you paint, draw, sculpt, etc? Showcase your gecko art in this forum. Post your gecko related videos in here. Also for techniques or questions related to making gecko videos. Discuss any new and exciting herp products in this forum. Post herp society meetings, upcoming shows, and symposiums here. Post any gecko/herp related news, review a book or an article. Discuss freshwater, saltwater, and brackish water tanks here. My Dwarf Puffer Fish Tank! Who doesn't dig a cool mantid, scorpion or spider, right? Want to talk about other herps? This is the forum for you. If it doesn't fit in any of the other forums, it should probably be posted here. Most users ever online was 3,475, 11-26-2015 at 04:16 PM. Forum Tabs by ForumTabs (Pro) - vBulletin Mods & Addons Copyright © 2019 DragonByte Technologies Ltd.